Dr. Heather Manley, a naturopathic physician licensed in the state of Hawaii has put together this wonderful adventure workbook and audio CD about two sisters, Merrin and Pearl, who travel through their baby brother’s digestive system to take out a penny that he has swallowed. 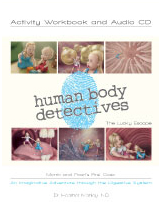 The Human Body Detectives is designed for homeschooling parents, families and teachers as a tool to teach their kids about science and the human body. The first book in the series, The Lucky Escape, comes complete with stickers and fun activities for kids ages 6-12. Your child will have fun while learning about the digestive system and how it works. My children loved the story and the book is also a lot of fun and teaches about the digestive system and eating right. I am looking forward to listening to more creative adventures in this series. You can win your own copy of The Lucky Escape by following Dr. Manley on twitter or becoming a fan of The Human Body Detectives on facebook and leaving a comment here at Healthy Moms. You must become a facebook fan or follow her on twitter first. Grab our button for your site. For every entry including extra entries please leave a separate comment. Winners will be chosen randomly from the comments and e mails that I receive. The contest ends on November 9, 2009 at midnight PST. I do not do either. I follow Dr. Manley on twitter. I'm a Healthy Moms subscriber.